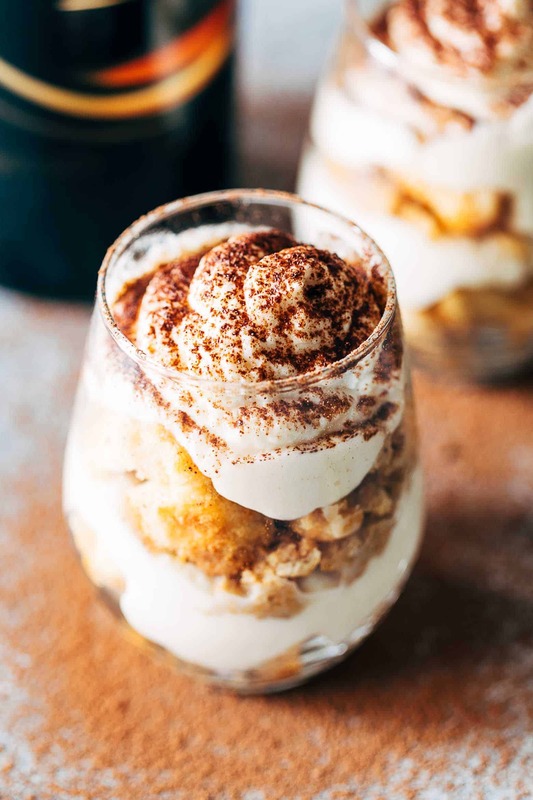 Easy Baileys Tiramisu Trifle Cups are a fun take on the classic Italian Tiramisu recipe. 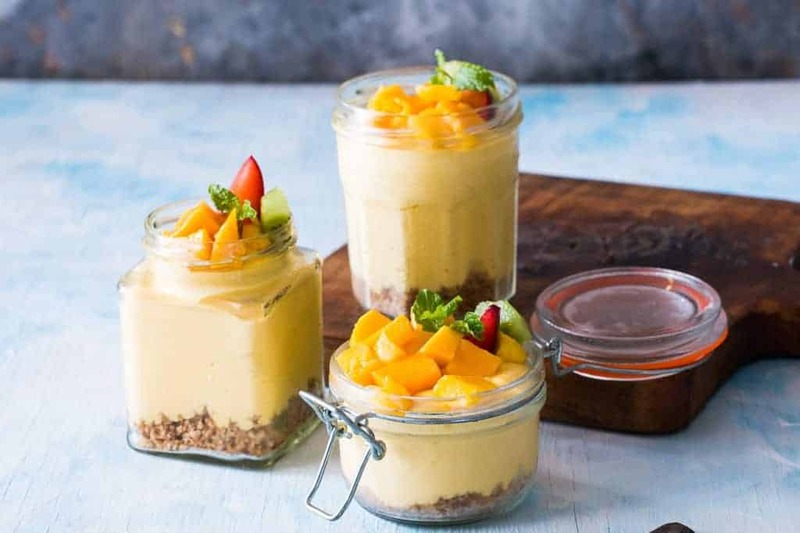 Made eggless, this make-ahead eight ingredient dessert is the perfect summer recipe. Hello hot weather, fun beach parties, summer holidays and picnics. 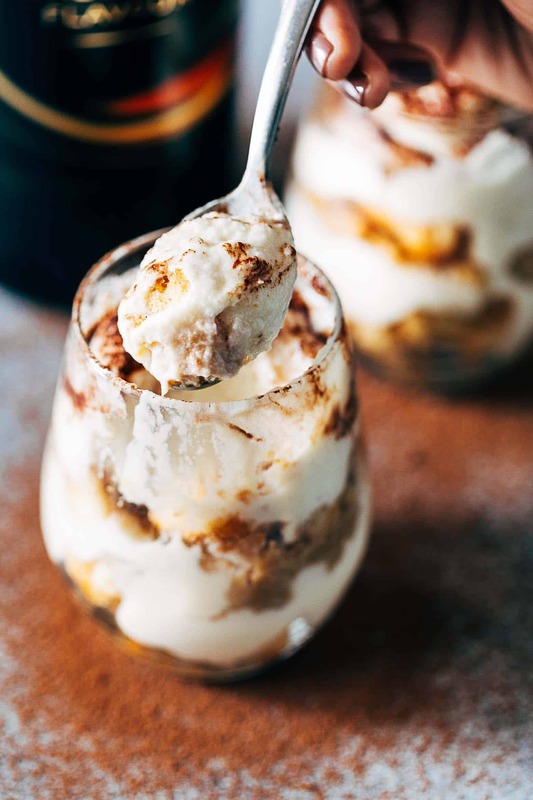 Today I have the perfect dessert for every summer thing you want to do – easy baileys tiramisu trifle cups. I was browsing through one of my favourite Italian food blogs – An Italian in my Kitchen thats actually run by my close friend Rosemary and thats how this idea came up. She has not one but quite a few recipes inspired by Tiramisu and if there was one place I would trust to learn how to make Tiramisu, its her blog! She also has tons of pasta recipes and some really interesting Italian recipes like her Lots of Fresh Basil Tomato Sauce (don’t you just love the name?) and Minestrina Italian Feel Better Soup! I’m still keeping it easy though, and do-able so that you don’t look at a recipe and go like – I can’t make these. Because that’s the whole point of this food blog – how to cook more often at home. 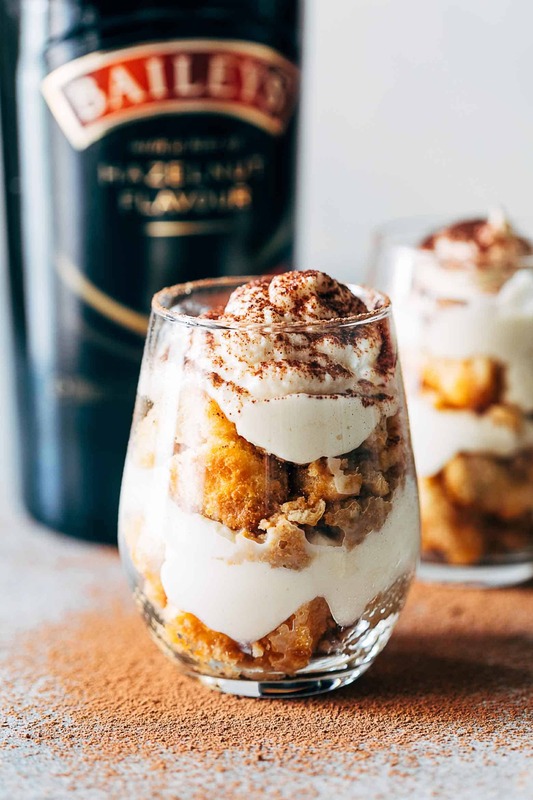 Which is why instead of an elaborate classic tiramisu recipe, we are making these fun, easy baileys tiramisu parfait cups which taste EXACTLY like a tiramisu except you don’t need to make the custard from scratch, use raw eggs or go through the extra steps of tempering them. Now you can choose to make the tiramisu the proper italian way, but. 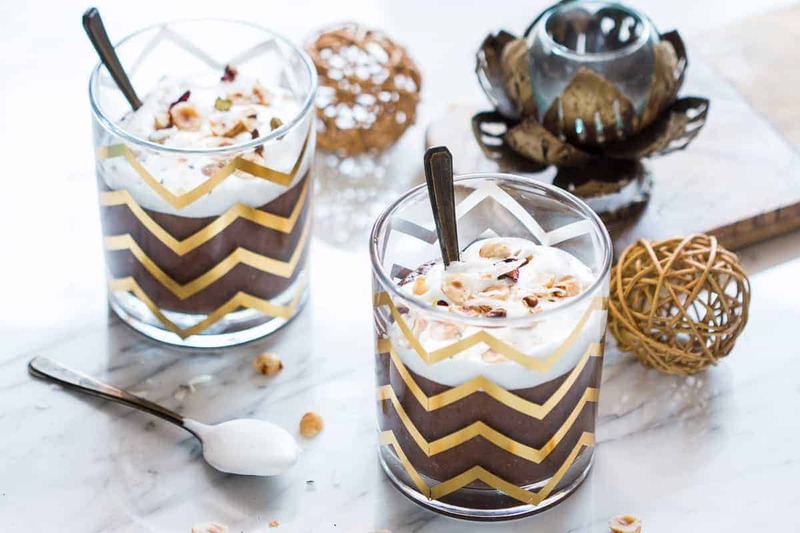 Why should you make these Easy Baileys Tiramisu Trifle Cups? But if you are still wondering, let’s also look at. How to make a classic Italian Tiramisu? A classic Tiramisu is a labour of love and can be silky, rich and yet light. Traditionally, a tiramisu recipe uses raw eggs which are whipped till light and creamy and then folded with mascarpone cheese to make a base. Here’s a great recipe if you’d like to try one. What type of alcohol is normally used in Tiramisu? Tiramisu is generally made with marsala which is a sweet wine produced in Italy. But we’ve used Baileys here because it adds to the coffee flavour in the Savoiardi (lady finger biscuits). You can easily use dark rum, kahlua or even brandy. 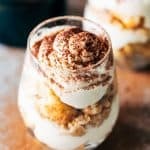 What can I substitute for Mascarpone Cheese in Tiramisu? I wouldn’t recommend substituting mascarpone cheese for any other in the recipe because mascarpone is a non salty, mild flavoured creamy cheese. But if you absolutely have to, cream cheese can work as a substitute for mascarpone in a Tiramisu. I think I’ve made it waaaay easy for you to make a Tiramisu now. Because you can use this recipe as a base, and go crazy if you want by adding you own flavours (maybe some crushed Oreos), substitute the Baileys for Kahlua or Dark Rum and add some coffee powder if you like yours extra strong! Send me pictures when you try these okay? Chill a large bowl and heavy whipping cream in the fridge for at least 20 minutes before you start making this recipe. Add the lady finger biscuits to a ziplock bag. Break them into smaller pieces with a spoon. Mix together brewed coffee and baileys in a bowl. Add the lady finger biscuits and mix. Set aside to soak. In the chilled bowl add heavy whipping cream and mascarpone. Whip on high till stiff peaks form. Add honey, baileys and vanilla extract to the mixture and mix well. To assemble, add a tablespoon or two of the soaked lady finger biscuits to a glass. Add a layer of the cream mixture, another layer of the biscuits and a final layer of the cream mixture. Dust with cocoa powder to finish. Repeat with other glasses till all the cream mixture and biscuits are used up. I wish Sunday hadn’t gone away too but for completely different reasons! Thanks for stopping by. I love individual serving desserts. Perfect for summer BBQs! !